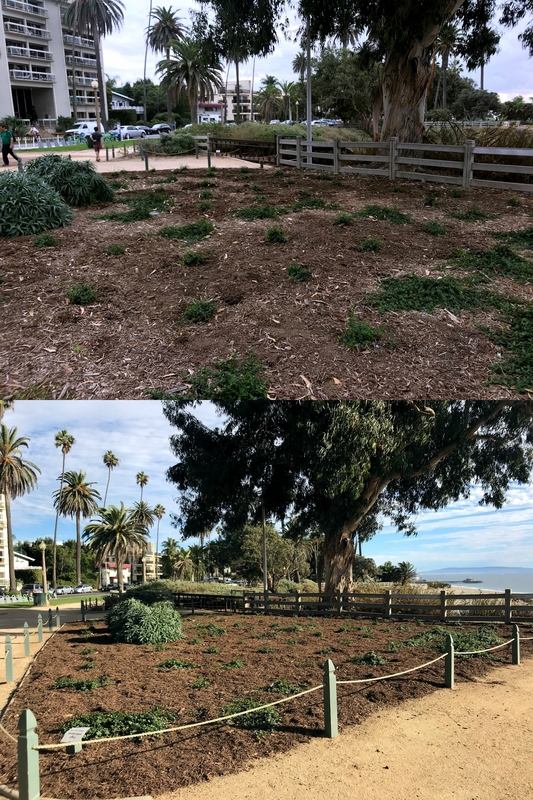 Spring was a time of renewal and regrowth, and at historic Palisades Park you will find a transformation of nature due to the change in the season and a transformation due to the work of the city's Public Landscape Division staff. Palisades Park sits atop a bluff overlooking the Pacific Ocean and extends 2 miles from Adelaide Drive at the northern border of the city down to Colorado Avenue. The park, which dates back to 1892, spans 26 acres and contains 192 benches, 102 trash cans, and 27 picnic tables among other amenities such as restrooms and drinking fountains. Heading into spring, staff did some nice work to spruce up the park. The city's largest and oldest park also contains over 1,200 trees, nearly half of which are palms. A key characteristic of the park is the colonnades, or rows, of palm trees orientated north to south and primarily composed of the Mexican fan palm (Washingtonia robusta) and Canary Island date palm (Phoenix canariensis) species. Unfortunately, some of the Canary Island date palms have succumbed to a fungal disease and have been removed during the last 10 years. 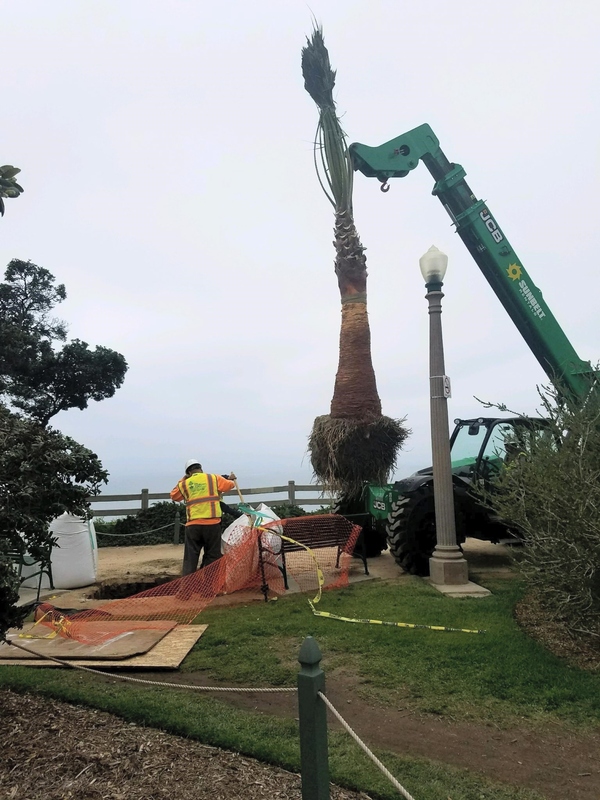 To address this, staff oversaw the planting of 56 palms of the following three species resistant to the fungal disease: Mexican fan palm hybrid (Washingtonia robusta x Washingtonia filifera), date palm (Phoenix dactylifera), and the California fan palm (Washingtonia filifera). These new young trees, added to the older trees, provide species and age diversity that adds to the sustainability of the park. California fan palm hybrid installation. Here's a walkthrough of more improvements starting at Inspiration Point at the north end of Palisades Park where staff replaced eight damaged trash cans. As you walk south from there, you will find a new bench behind the Millennium Wall near San Vicente Boulevard. Continuing south at Montana Avenue, you'll see the new drought-tolerant Natal plum (Carissa microcarpa) shrubs that staff planted to replace aging plants. The area prior to the work (top photo) with the same area freshly revived (bottom photo). The Public Landscape Division, part of the city's Public Works Department, maintains and enhances the city's parks, landscapes, urban forest, downtown and Santa Monica State Beach. To receive a brief and illustrative newsletter featuring improvements to these areas emailed to you monthly, please sign up here or email [email protected]. Newsletter archives and more about this team's work can be found at www.smgov.net/landscape. Work is also featured on the City of Santa Monica's Facebook and Instagram accounts. This article first appeared on the City of Santa Monica's blog. It was authored by Carlos Collard.